Somehow or other, we quickly shook off the trials and tribulations of Africa on the Egyptair flight to Madrid. Easy to do among the crowd of Spanish holidaymakers returning home after their fortnight´s break. 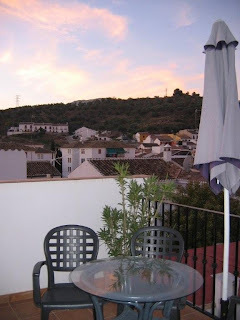 As arranged, Max´s brother Brian met us at the airport and drove us to their apartment in the township of Majadahonda, less than 20km from downtown Madrid. It was great to catch up with the family and we spent the weekend enjoying the company of our nephews, and sister-in-law Sally. Brian and the boys raced various options in the Majadahonda fiesta miles, Brian getting third place and a sparkling new trophy to add to the family collection. 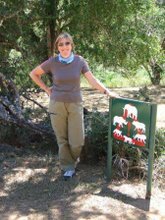 If we hadn´t realised living in Spain was going to mean a different kind of life, we did after these events. Brian´s race was run at a more or less reasonable 7pm on Saturday evening. Reece, who is 8, got to run around 8pm and Aidan who is only 6 had to wait till 8.30pm for his event. Somehow I can´t see harrier races at such times being a hit in NZ. But it was a lovely evening, and nice to enjoy a tapas supper outside afterwards. Sunday lunchtime we rejoined the festivities, and sampled paella and a bottle of local wine in the town square while taking turns to queue with the boys at various jumping castles. A very gentle and pleasant introduction to our new home. 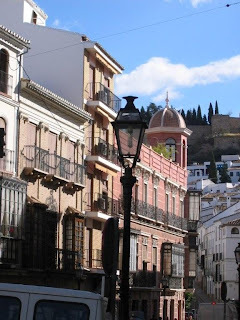 Monday morning we were up early and off on the local train to Madrid´s rail hub Atocha and then to Antequera - our Andalucian town of choice. We arrived incident free and on time round noon, and taxied into town and into the pension we´d booked online. They met us with "estamos completo", but no matter, they´d rebooked us across the road at the Hotel Castilla - all fine with us. The Castilla was a nice place and very friendly. But better than that Antequera, even at first glance, seemed to meet all our requirements. Firstly, it was gorgeous. Lovely buildings, squares,, fountains, statues, churches and even a castle on the hill. Secondly, there were lots of eating and drinking options. Thirdly, we saw a few joggers and cyclists out and about in the nearby olive-clad country lanes. Fourthly, the shopping looked really really good (this could be because I´ve been away from shops for a bit too long...). And finally there were lots of real estate agents. We strolled into Carlos´office to see what he had available. There were a couple of likely options and we arranged to meet him again at 11am the next morning. Meanwhile, we popped into another agency we´d found online - run by a family originally from Woolangong! In spite of that, we checked out the flat upstairs they were trying to let. It was interesting to see, and in a brilliant location, but not really a very good set up and a bit dark and dingy - in a classic European kind of way you understand. Near the Plaza San Sebastian, with a view of the castle on the hill, and a nearby fountain (there are lots of these here). Typical Antequeran streets - narrow, steep, with old folks and scooters (we have plenty of both here). One of the town's 20+ churches. The Plaza Castille, with town gate and bullring in the background. 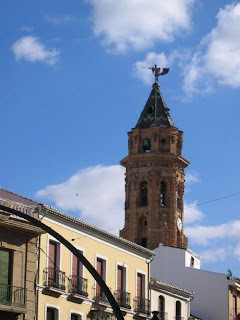 A view of the Anjelote, a windvane on the spire of San Sebastian - apparently with a vial containing the bones of Santa Euphemia (one of Antequera's several saints) somewhere on him. A church that's been converted into a museum (we can spare a couple) - the Roman baths are just beneath El Colegio, and it's recently hosted a baroque exhibition, which is now touring the province. 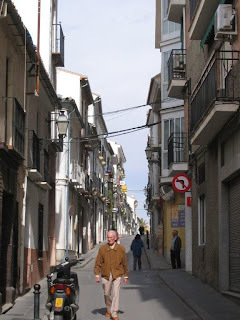 On Tuesday morning Carlos took us out to the ´burbs of Antequera to a four storey but small-roomed townhouse, unfurnished - which over here translates as no light fittings, no stove, no hot water heating and no kitchen benches. A bit too bare for our liking. 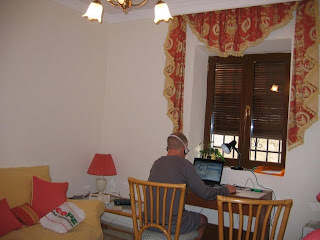 He then took us to meet an English couple who had registered their house just after we´d been in to see him yesterday. It was perfect, well better than that really. 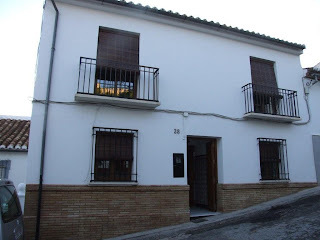 I mean, I´d hoped to get two bedrooms so we could easily host guests (and secretly I´d hoped to have either Diego Ponce or Bastardos as an address - two of Antequera´s better named streets), but I never thought that I´d end up with two kitchens, one being a full ´summer´ kitchen outdoors, and a ¨Royal¨street. 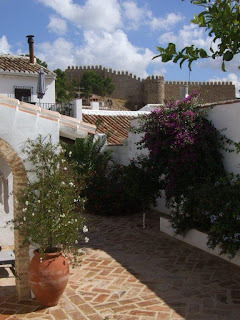 The house is fully furnished too as it´s been a holiday home, and has three bedrooms, two small living rooms and a large one, three bathrooms, a lovely courtyard garden and a garage also. And it´s quite affordable too - only 500€ a month. They are leaving TVs, DVD players, furniture, kitchen equipment, linen and lamps and the outdoor furniture for us. Lucky, lucky, lucky. We had hoped to sign the contract on Wednesday, but they need a couple of days to do the inventory, so we agreed to sign it on Monday, when we are back in town. Our home for the next few months, Cuesta Real 38, complete with Spanish-style electric wiring across the front, redeemed by the castle reflected in the window. A couple of shots of the back garden, or patio. 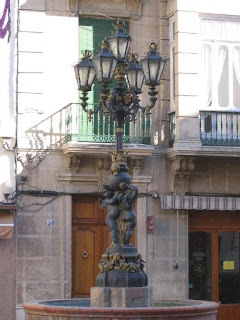 We decided to check out a little bit of Spain, and made our way to Cadiz on Thursday, a lovely old town on the Atlantic coast, and just a couple of bus rides away from Antequera. 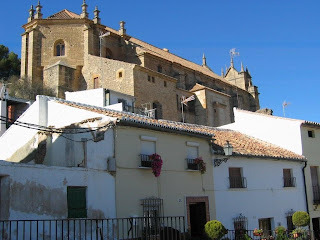 It´s a lot bigger than Antequera and we enjoyed a couple of days wandering the city streets, swimming in the bay and learning a little of the history of this town which has Roman and Moorish roots and the usual stunning array of charming squares, narrow picturesque streets and churches whenever you turn around. We found a good bookshop on our first day here (something that so far we haven´t discovered in Antequera), and also picked up a programme for Cadiz´s film festival. I´ve been hearing from those of you in Wellington about this year´s festival there, but here we caught Jonathon Demme´s production of Neil Young´s ´Heart of Gold´. The organisers were only charging 2€ a ticket, and had optimistically laid out a few hundred plastic chairs for the outdoor screening. At least half of them were filled with latter day hippies and film buffs by 9.30 and we really enjoyed the movie for around an hour before the thunder and lightning storm that had been theatrically rolling around turned into a downpour. There was room for us all to shelter under an awning and continue watching till the end, but I felt a bit sorry for the follow up act. Felix Slim (who Max christened Happy Skinny) was a local blues guitarist who could really play but whose singing was a kind of whiney half Spanish half English. Robbed of the atmospheric outdoors by the rain, he struggled a little in the bland indoor venue and after a few minutes we quietly left and wandered back to our pension slipping and sliding on wet cobblestones. 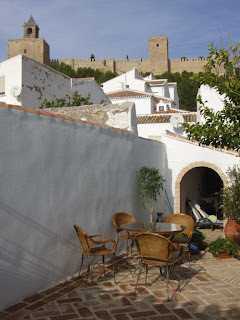 After a few more days in Antequera, this time at the somewhat more budget-oriented Hostal Reyes, and with a signed 10 month lease in our hands, we headed back to the coast thinking to enjoy it while the weather is so good. 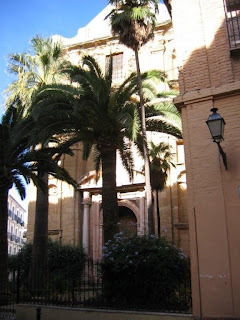 Malaga was our destination this time, and in spite of its dreadful reputation, we had a good time. Have to admit that we spent quite a bit of time shopping. 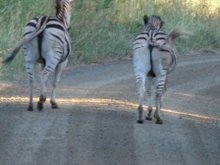 Our Africa travel clothes are looking a little worn, and our shipped goods won´t be with us till next week so we have splashed out on a couple of new outfits each and, wonder of wonders, some new underwear. We feel a million Euros now! 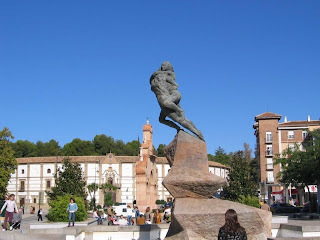 So it was back to Antequera, and into Cuesta Real. It's going to be lovely living here, and you'll see why when you see the pics of the house. 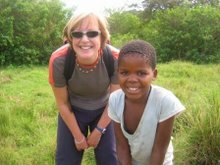 We moved in on 2 October, and on the fourth my mother and sister arrived. Unfortunately our shipped goods weren't released from Customs until about October 15, and weren't delivered to us until the 22nd, after going astray for a few days. In the meantime though, we visited Ronda, Granada and Cordoba with Mum - saw all the sights including our first flamenco show. I took Mum back to London, and spent a few days there before arriving back here at the end of October. Finally it felt like we were settling in, after months of constantly being on the move. 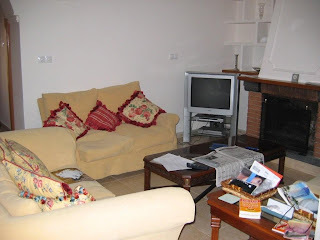 The living room - we get BBC and ITV plus a few news channels on the tele, and have yet to work out how to get the local Spanish channels. We have been given the name of a neighbour, Pepe Huertes, who apparently can help. The office, relocated hub of O'Kane enterprises, and working well now we have broadband, a printer/scanner and the laptop all humming. The view from the upstairs terrace - olive groves, ponies and the countryside. Andalucia feels like 'real' Spain, full of flamenco, football and bullfighting - hence the fridge theme. Incidentally, the fridge is full of jamon Iberico, cheese made with a mixture of cow, sheep and goat milk, and Cruzcampo beer.